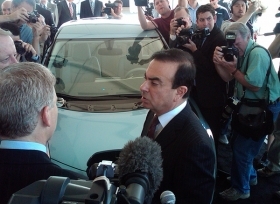 Carlos Ghosn and the Leaf in Smyrna: “The signs coming are very encouraging.... But they are still not sales. We have to be careful." SMYRNA, Tennessee -- Even with more than 13,000 paid reservations in hand in the U.S. for his electric Leaf, Nissan Motor Co. CEO Carlos Ghosn wants to see hard sales numbers before opening up more production capacity for the vehicle. Speaking to reporters here Wednesday, Ghosn said he is content to remain capacity-constrained on the new model for two years until he sees evidence that customers are buying. “No matter what happens, we're going to have constrained capacity,” Ghosn said after a ceremony to build a new Leaf assembly line and battery plant here. Ghosn has become one of the industry's most bullish proponents for global sales of electric vehicles. In addition to the Leaf, Ghosn wants to market a small electric city car, an electric commercial van and an electric Infiniti sedan in the United States. The Leaf's 13,000-plus paid reservations have been received even though the car is still seven months from its December U.S. introduction. Nissan also has received 130,000 consumer requests to receive information about the model, a five-passenger sedan that promises 100 miles per battery charge. Ghosn said the current pool of reservations already exceeds Nissan's manufacturing capacity -- a situation that probably will last two years. The car initially will be sole-sourced from Japan for worldwide distribution. The new 150,000-car-a-year assembly line in Tennessee will not begin producing in volume until 2013. But Ghosn said the early inconvenience is not enough to sway him to seek more production capacity. “The signs coming are very encouraging,” he said after his public ceremony. “We see the number of hand raisers -- 130,000. The number of people putting in reservations and paying a little bit of money -- 13,000. “They're all encouraging. But they are still not sales. We have to be careful. “If we see, when December comes and actual sales start, the hand-raising and pre-ordering transform fully into sales, we'll have to make some decision and action on capacity,” he said. Another wild card in the rollout is China. There are no plans for Nissan to introduce electric vehicles to China, which is rapidly becoming a key market for Nissan. Ghosn said that until the Chinese government decides on a policy to provide consumer tax incentives to support the sale of electric vehicles, Nissan will not attempt to sell them there.